Land on the Isle of Arran from the Scottish mainland and you will find yourself at the ferry port of Brodick, the hub of local activity. It’s only fifty minutes away from Ardrossan harbour on the ferry, but a world away in life style. 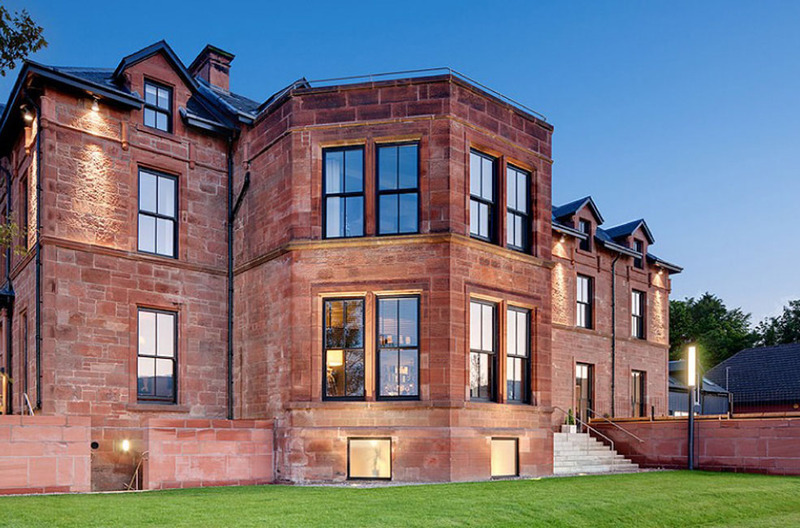 Look across and you will see, a stone’s throw from the port, the charming red sandstone facade of the Douglas Hotel. 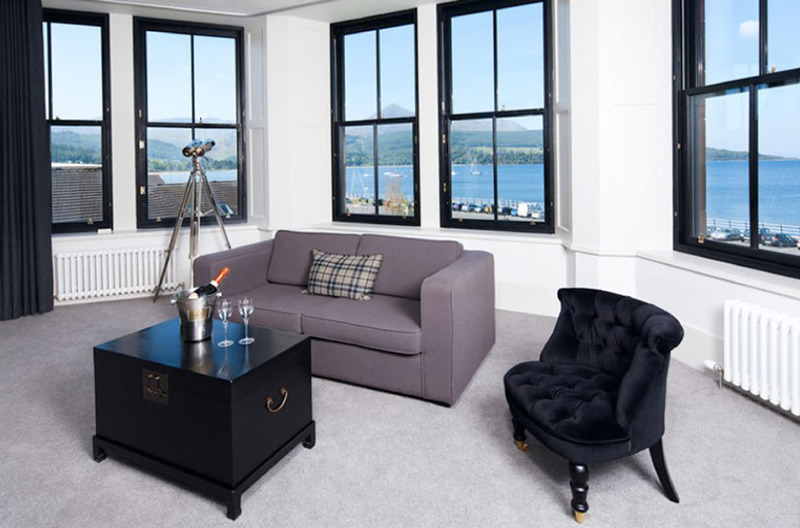 A former hunting lodge which originally belonged to Brodick castle, this 22 room boutique hotel has been beautifully restored and offers a taste of understated island luxury. The hotel is a real family affair, owned by Sean Henry and run by his sister Elaine Campbell, even her children work here too! Bought in 2008, when it had fallen into disrepair the whole building was taken back to a sandstone shell in order to upgrade everything to a top four star hotel level. The imposing Victorian building, which overlooks the harbour, looks from the front much the same today as it did 150 years ago, but that’s probably the only thing that hasn’t changed. The rear of the building is new, but it sympathetically blends in with the old. The rooms are spacious and we were lucky to stay in the amazing balcony room with great views from three dormer windows, and with a huge bathroom. 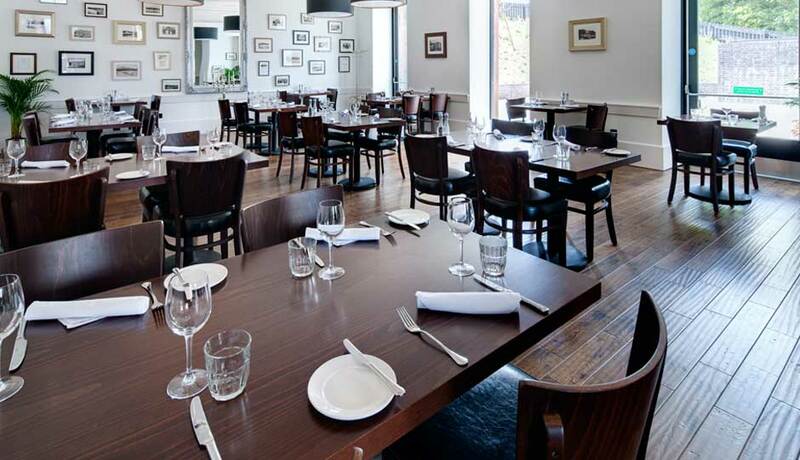 The bistro is quite chic with as much food being locally sourced as possible, and we enjoyed delicacies such as Scottish scallops, Cajun Scottish Salmon and smoked Haddock risotto. Unsurprisingly seafood is a must try on the island! 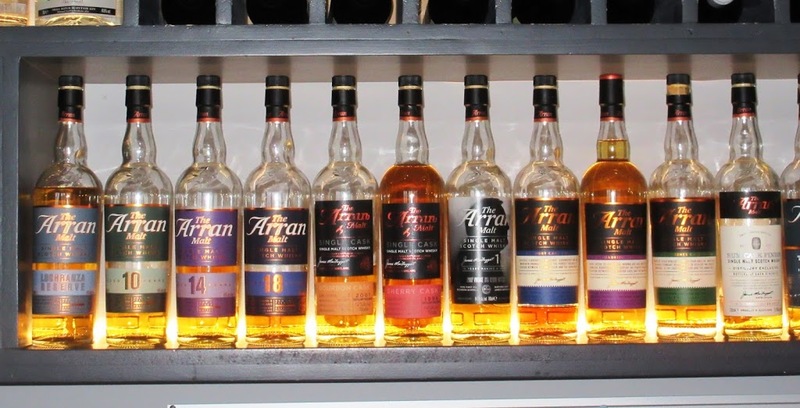 The bar has a huge selections of spirits and ales including fourteen Arran whiskys and even the first Arran gin! 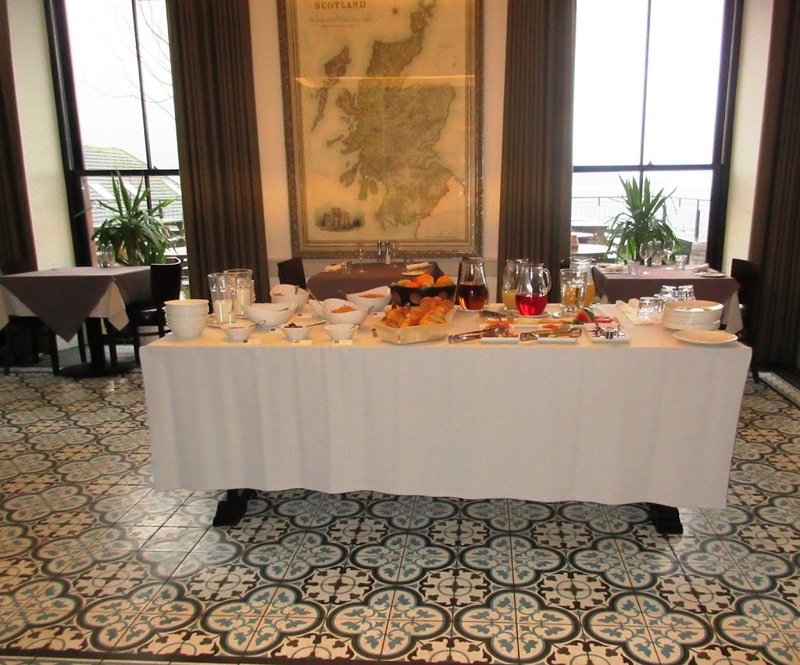 The Douglas has great friendly staff, many live here on the Island, and has won quite an array of awards including the Scottish Boutique Hotel of the Year. About half of visitors here are from Scotland but people from the US, Canada Scandinavia and lots of other countries have also enjoyed a stay at the Douglas Hotel. The island attracts all kinds of people from walkers and wildlife enthusiasts, to whisky aficionados and golfers. There are seven golf courses on the island and you can play a round of golf at every one of them for only £110! 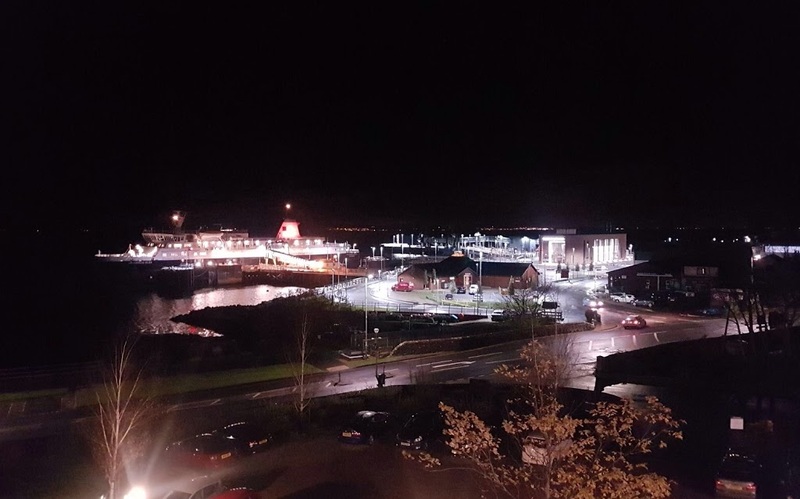 Everything is about the view here, and the Douglas plans to expand to provide twelve new rooms which will all have a view of Goat fell, the highest peak on Arran, a log burning stove and a skylight window to see the stars. The lack of light pollution here makes for great star gazing. 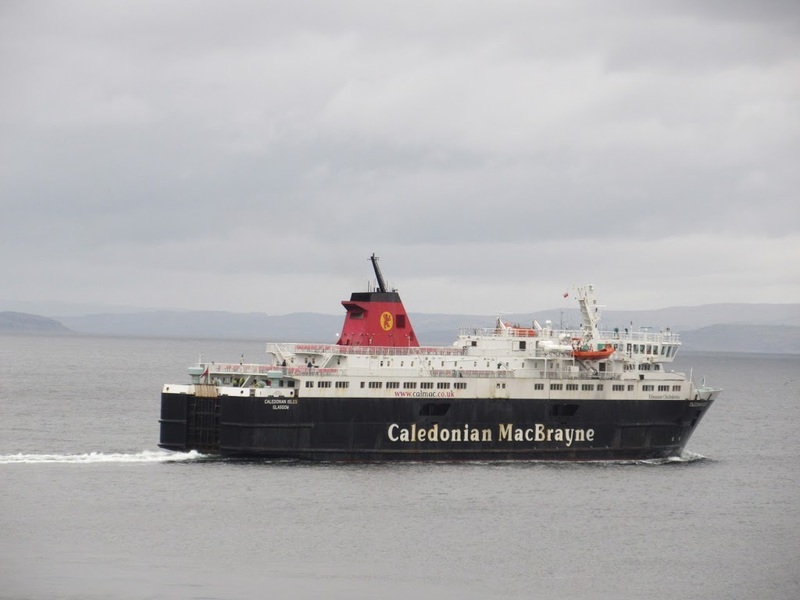 The location is just perfect with great views out over the bay and the rolling Arran hills to your left, and the living picture of the coming and goings of the Caledonian MacBrayne ferry port off to the right. The island scenery is outstanding with rugged granite mountain peaks in the north, the green rolling hills of the south, beautiful villages and dramatic, ever changing coastal views around every corner. We enjoyed the gorgeous Autumn colours of Arran with the gold and red leaves of the trees, and the heather and grey greens of the moors and moss. 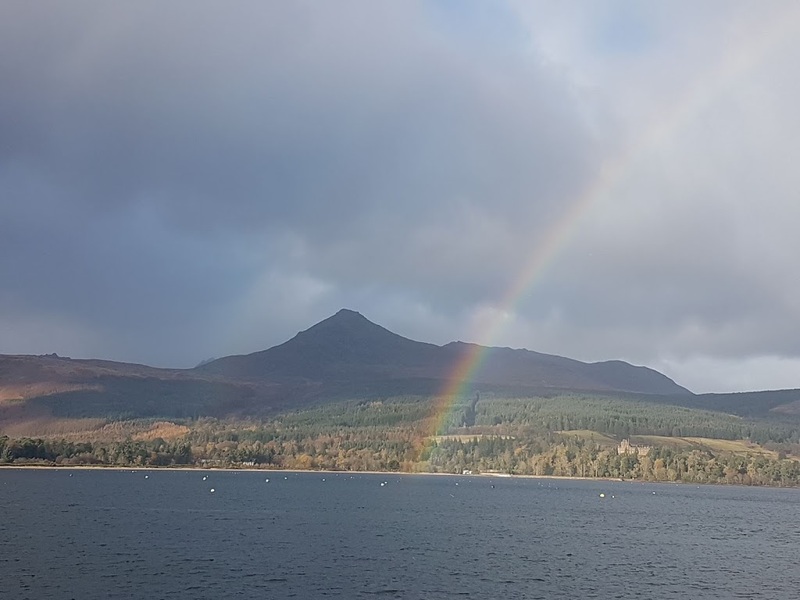 The weather did change its mind every ten minutes, and I have never seen so many rainbows in one weekend as I did in Arran in November! The Douglas Hotel does a great New Year package when guests jump into the sea at 12 o’clock (it’s known as the Douglas dook!) and there are lots of offers to be found on their website here The Douglas Hotel The Douglas has a laid back friendly vibe and is one of the best places to stay on the island. Apart from the food, drink, and atmosphere, you could simply spend all day just watching the view. If you do happen to go and stay at the Douglas, mention my blog Eccentric England to the manager, and you will be treated to a free welcome drink into the bargain. The saying goes that Arran is the whole of Scotland in miniature, and I can’t think of a nicer place to stay while you are exploring it! Next Post:Auchrannie resort on the isle of Arran. I'm yet to get to this part of the country. I love the look of the landscape draped with those rainbows. 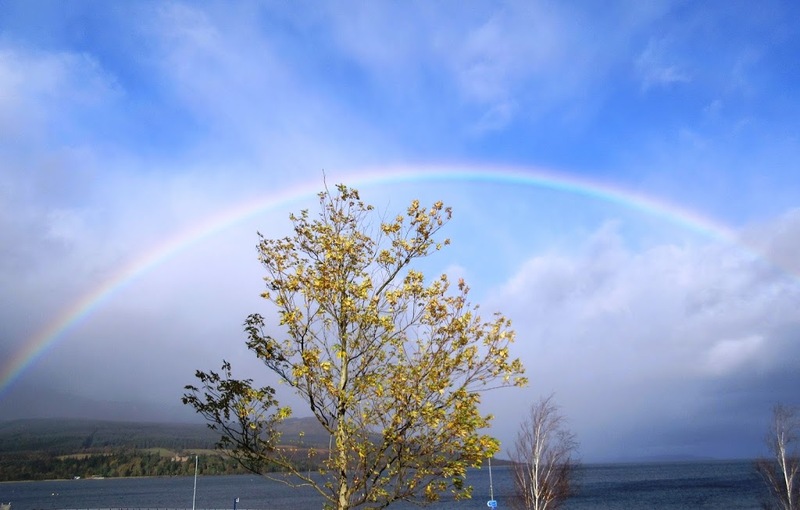 Yes it was a lovely sight I've never seen so many rainbows – you must pay Arran a visit! 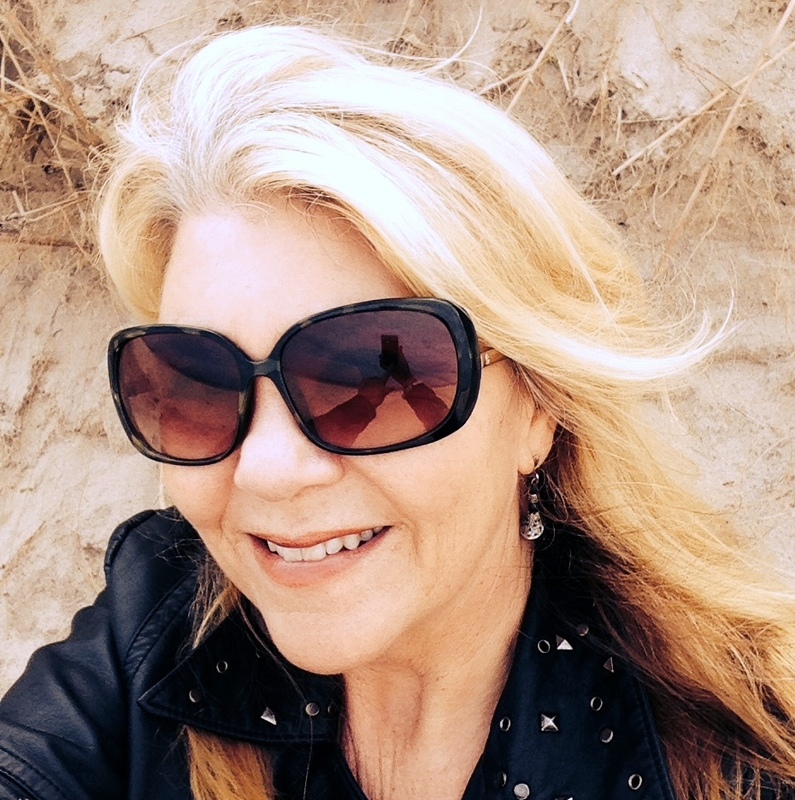 I like your blog Stuart what platform do you use – WordPress?